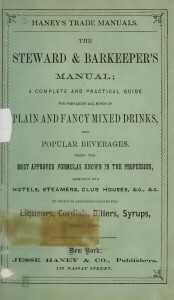 Haney’s Steward & Bartender’s Manual was one of many titles Jesse Haney & Co., Publishers produced for the trade. The reason this sample 82-page volume is of interest is because cocktail book collectors such as Mauro Majoub and drinks historians Jared Brown, Anistatia Miller, and Dave Wondrich believe this work may be the book that Harry “The Dean” Johnson referred to as his very first and earliest work. No one will ever know for certain. However it is intriguing to read through not only the drink recipes, but the formulae for fruit wines, cordials, liqueurs, and bitters that were documented during this early stage in American cocktail making.